A snow plow reportedly owned by the Village of Libertyville struck and killed a man clearing snow from his driveway. 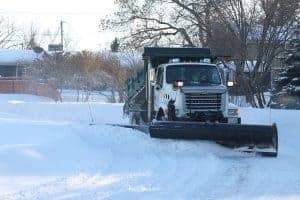 While the cause of the fatal snow plow accident remains uncertain, the tragic incident highlights the challenges of pursuing a personal injury claim for injuries involving a municipal vehicle. On the morning of January 28, 2019, at approximately 9:50 a.m., a man was using a snow blower to clear snow from the end of his Bridle Court driveway in Libertyville, IL. At that time, a village snow plow that was traveling down the cul-de-sac struck and killed the man. The deceased pedestrian’s identity has not been released. The driver of the village snow plow has been placed on paid administrative leave while the Lake County Major Crash Assistance Team investigates the cause of the snow plow accident. How this unfortunate snow plow accident occurred remains uncertain for the moment. However, it is worth noting that those who have been injured by municipal vehicles – that is, vehicles owned or operated by the governing body of a city or town – face certain challenges that those who have been injured by privately owned vehicles do not when attempting to pursue a personal injury claim. Aside from the usual obstacles involved in establishing who is at fault for a given accident, municipalities enjoy certain protections that the average citizen does not. Chief among these protections is a shortened “Statute of Limitations” period. The Statute of Limitations is the time specified by law in which an injured party has to file a lawsuit or otherwise successfully resolve a personal injury claim. In most instances in Illinois, the Statute of Limitations is one year for personal injury cases involving municipalities, as opposed to the two years that an injured party typically has in cases brought against private parties. (Certain exceptions may apply.) Failure to file a lawsuit or resolve a personal injury claim against a municipality within one year may result in an injured party being forever barred from doing so. This sharply-reduced Statute of Limitations period can significantly impact an injured party’s ability to mount a successful personal injury claim. In addition to limiting the amount of time one has to mount a proper investigation to determine the cause of a given incident, such as a snow plow accident, it could potentially prevent a plaintiff from properly identifying all of the parties who may be responsible. Depending upon the nature of the accident, an injured person may be able to pursue a claim against the municipality, the private contractor operating the vehicle, if any, the manufacturer of the vehicle, the driver of another vehicle, or some combination thereof. Again, identifying all of the potentially at-fault parties in a timely fashion is essential because plaintiffs who fail to bring their cases forward within the timeframe specified by law may find themselves prevented from obtaining full compensation for their injuries. Because of the inherent difficulties involved in pursuing a personal injury claim for incidents involving a municipal vehicle, such as a snow plow accident, injured people often find that they could benefit from the guidance of an experienced attorney to help them obtain the financial compensation that they deserve, such as the Illinois truck accident attorneys at the GWC Law Firm. With over $2 billion recovered for our clients and offices throughout the state, GWC is one of the premier Personal Injury and Workers’ Compensation law firms in Illinois. If you have been injured, in a snow plow accident or in some other way, please contact GWC today to schedule a no-cost, no-obligation consultation with one of our attorneys. Call our office at (312) 999-9999 or click here to chat with a representative at any time. Call our personal injury lawyers today for a free consultation.